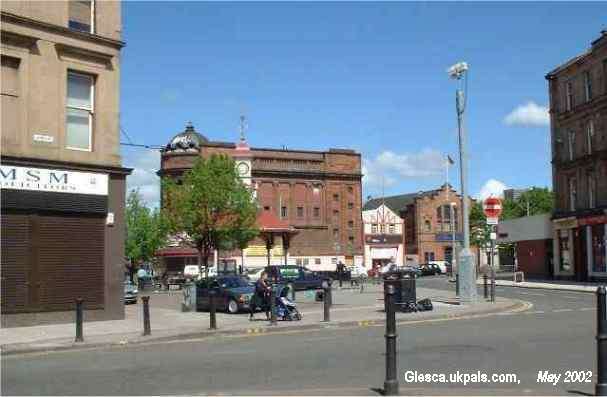 'Orange Hall' and Bridgeton X railway station is at the right hand corner, the other station opposite Landressy St.
is closed. Also note the CCTV which are installed throughout the streets of Glasgow....BIG Brother is watching ! Some of the tenements here, as you can see, were renovated. 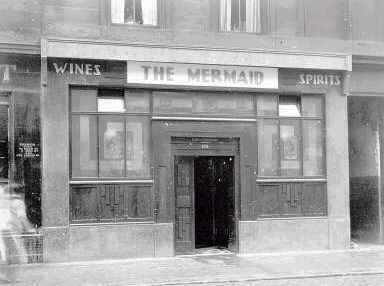 The blue pub was for many years was named "The Mermaid" a favourite haunt for the old Billy Boys gang. 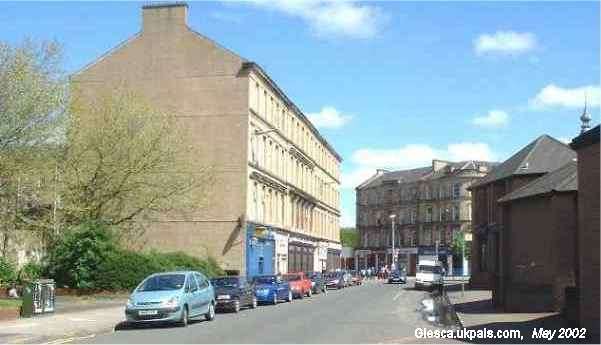 John is on the building roughly opposite the Pub and Post Office and Landressy St is in the background. from 14 yrs old to 65 yrs old and the only time he was off was for the WWII. His Da before him worked for the same firm from 14 yrs to 65 yrs again only taking time off for WWI. Quite a family record ! 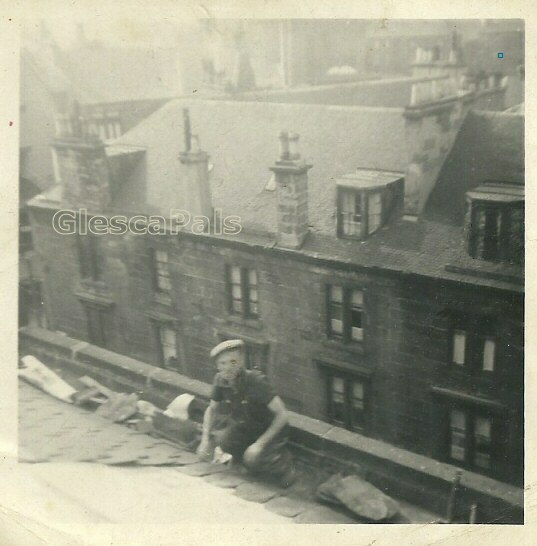 A great photo of a Glsgow workman hard at work,salt of the earth these old tradesmen,and putting new slates on the roof a vital occupation,for when we got the high winds the slates blew off,and we had to walk really close in to the wall on windy days so`s not to get hit,then the slater had to come out as the rain would get in if the slates didn`t get replaced. Full employment. We had a slaters and plasters at our close in Well St,Kennedys it was called. Great photo Webmaister. Seein' a' the windaes reminded me o' the windae cleaners who stood oan the ledges tae clean the ootside windaes. Nae safety harnesses or safety nets tae fa' oan should they be unfortunate enough tae slip or get blown doon wi' the wind. John McMillan an' a' these ither brave workmen certainly risked life an' limb jist tae earn their daily bread.